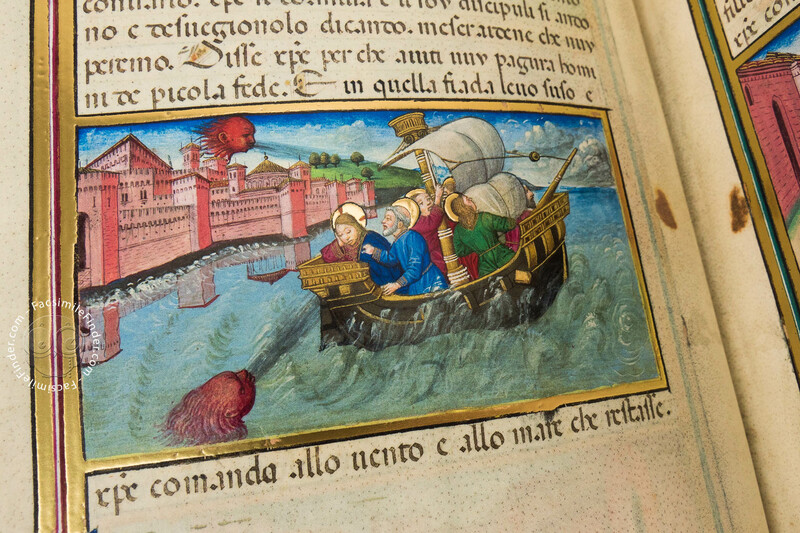 In 1476, the Duke of Milan Galeazzo Maria Sforza (1444–1476) commissioned this manuscript to a famous and talented illuminator, Cristoforo De Predis (ca. 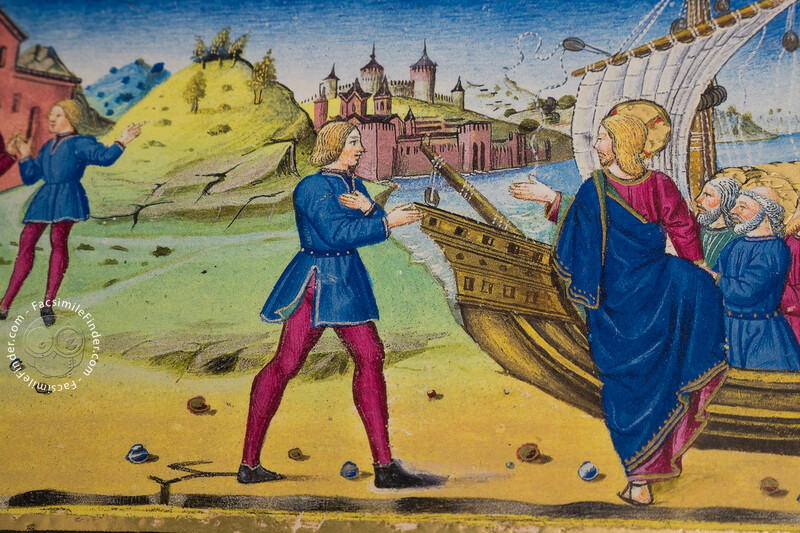 1440–1486). 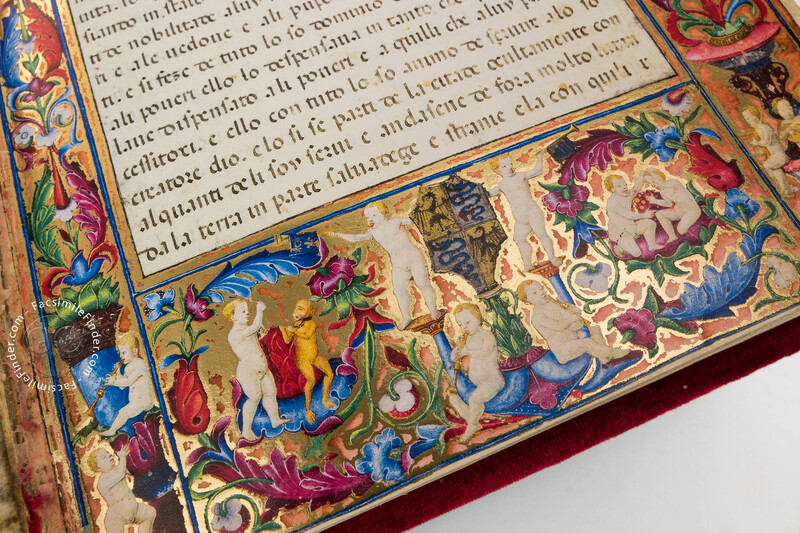 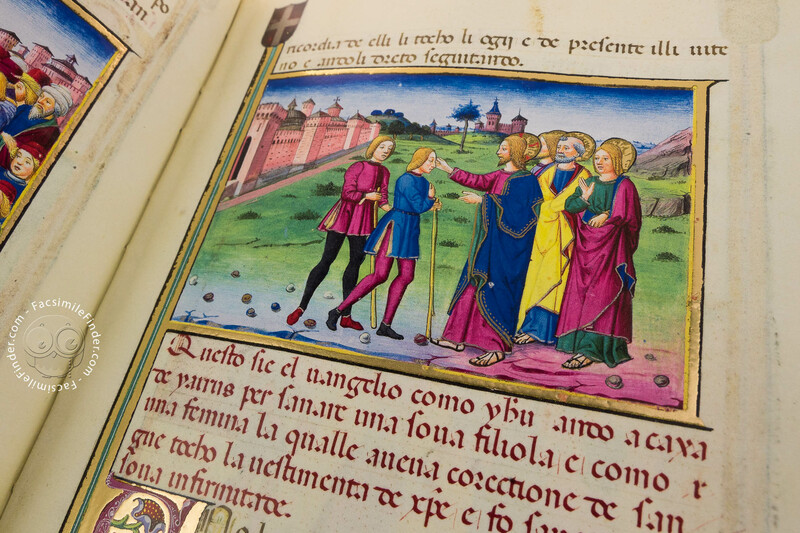 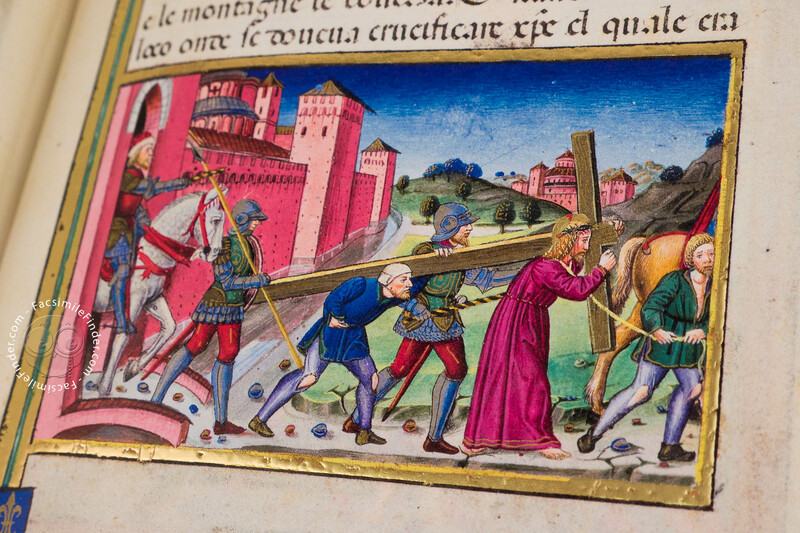 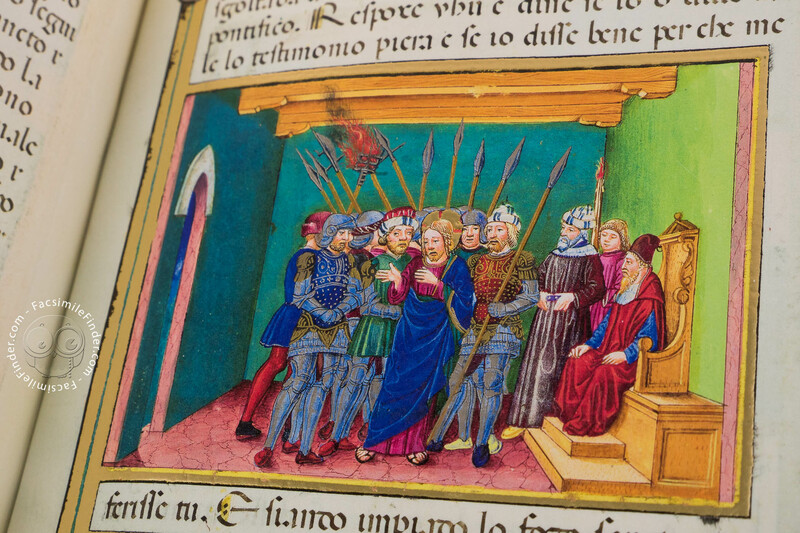 De Predis painted an opulent and widely illuminated book for Galeazzo Maria Sforza’s meditation. 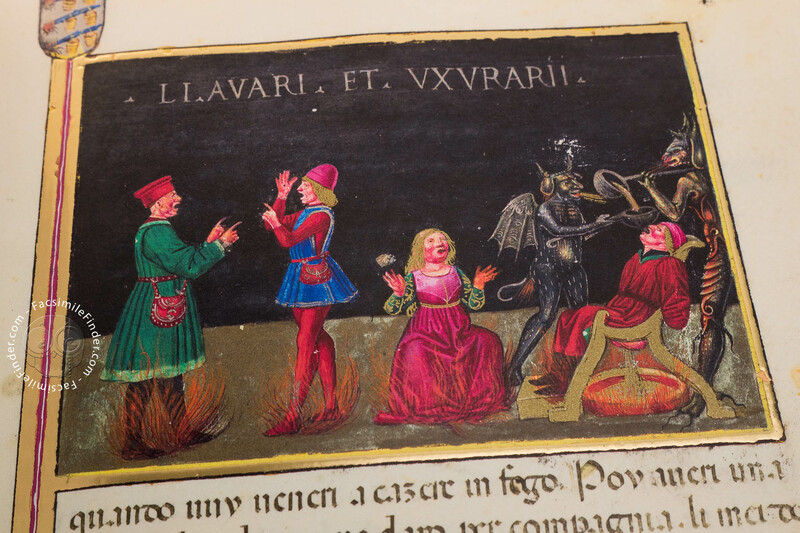 The codex displays 324 miniatures illustrating the narrative from the time in which the Virgin Mary was young up to the day of the Last Judgement. 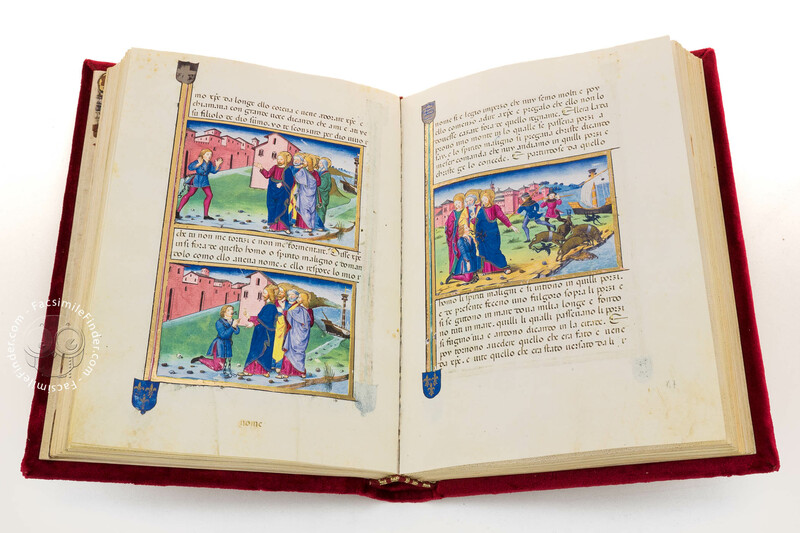 This devotional manuscript, known as "Legendarium" or "Leggendario" contains the illustrated legends of the parents of the Virgin Mary, Joachim and Anne. 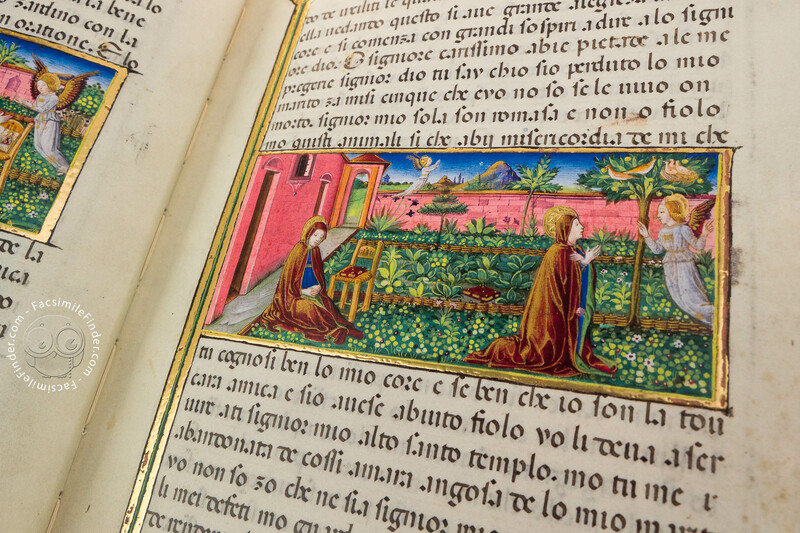 The text recounts the story of Mary’s infancy and life up to the Annunciation of the birth of Christ. 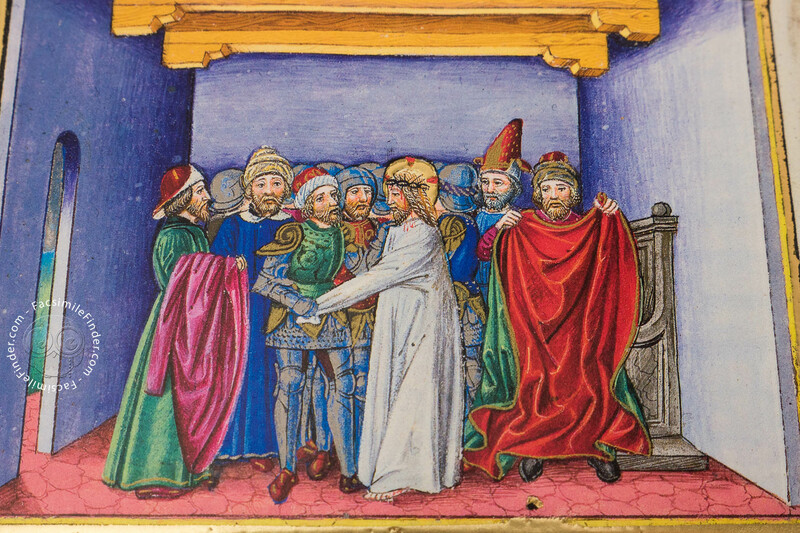 In a historical continuous, the narrative includes the events of Jesus’s life, the miracles he performed, the drama of his passion and the events after his death and resurrection. 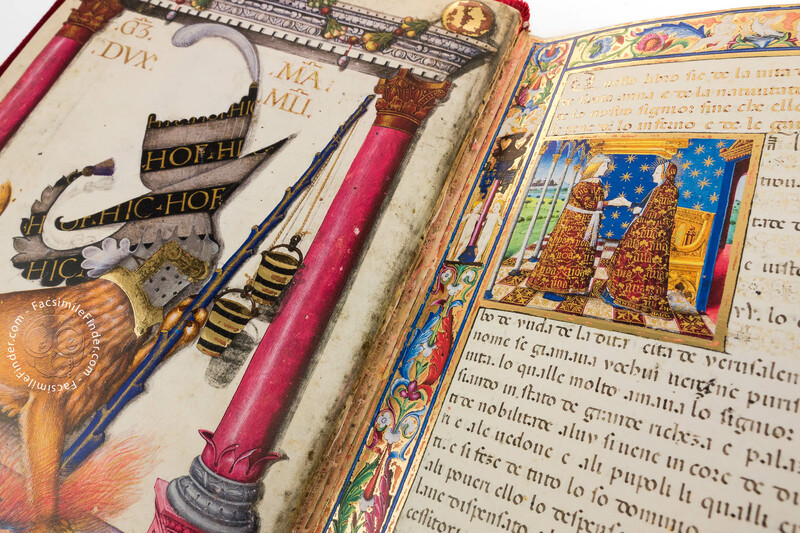 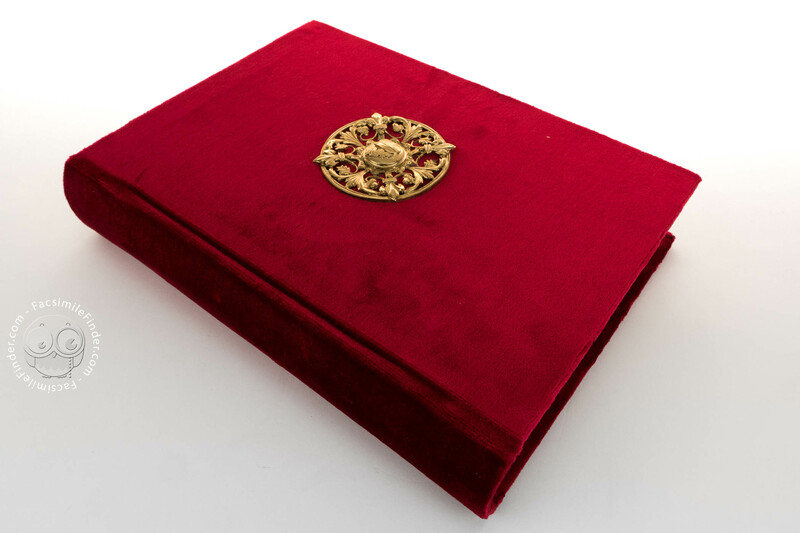 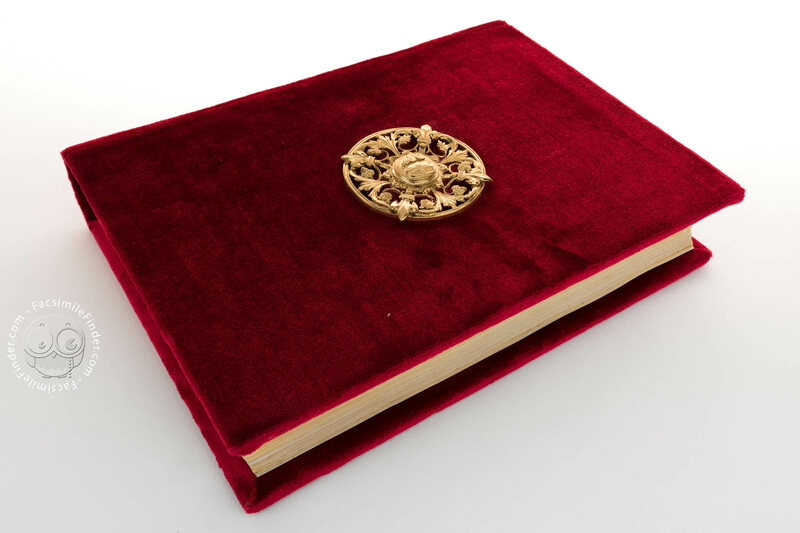 The decoration is remarkable for quality and extension, thus the manuscript was a vivid and rich colored book that enhanced the Duke’s devotional practices. 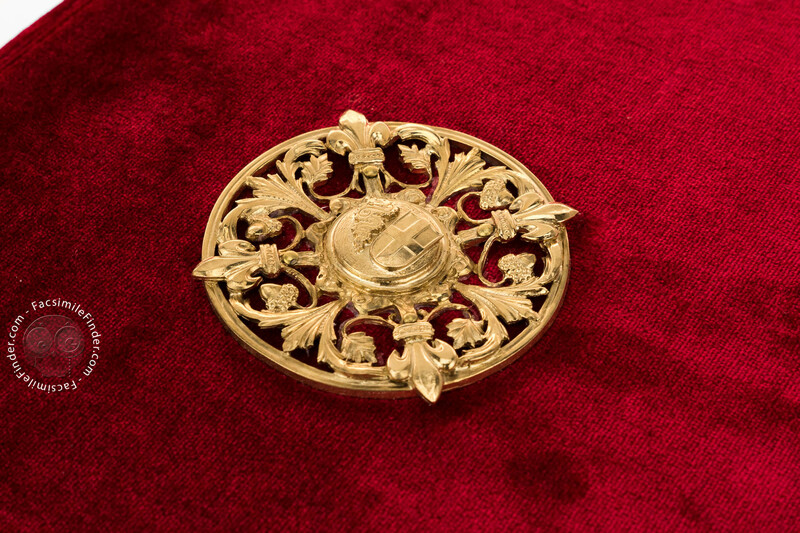 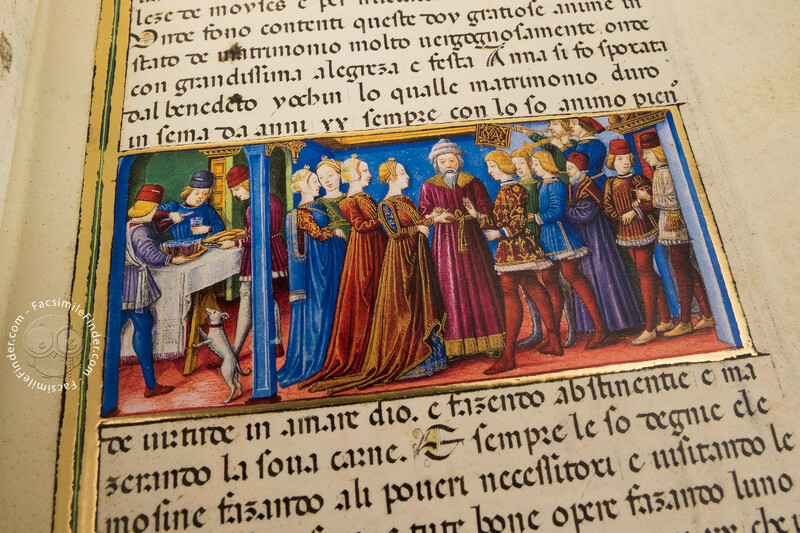 Cristoforo De Predis was highly valued as a painter at the Sforza court. 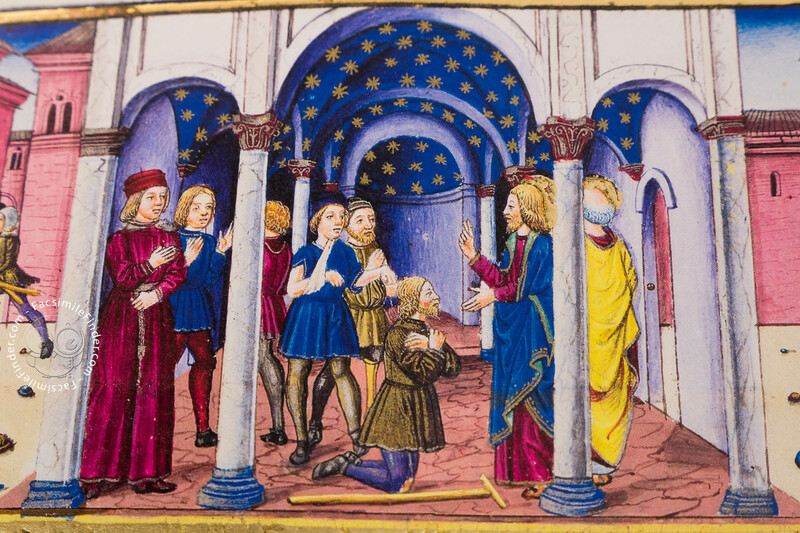 Deaf and mute, De Predis developed sharp observational skills, which increased his talent as a painter. 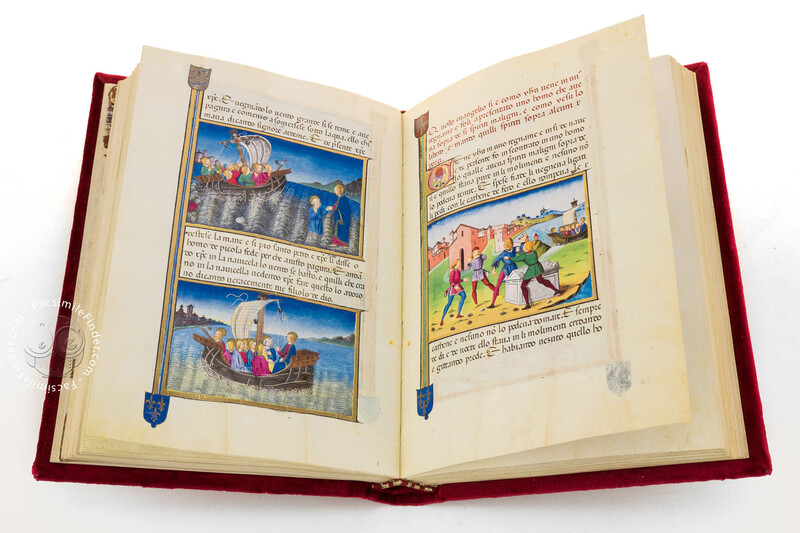 The art of Cristoforo de Predis consists of meticulous observations of reality. 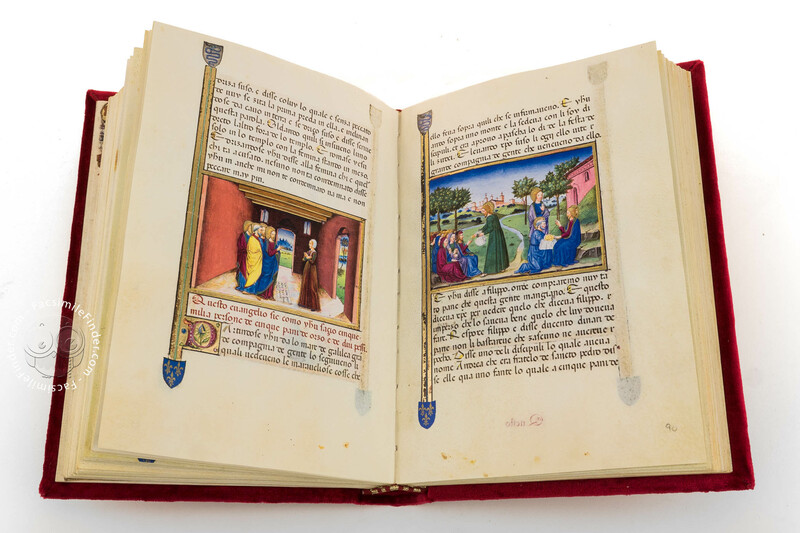 He observed a variety of environments such as the landscapes of the Po valley, the narrow streets and squares of the cities, the details of the architectures interiors. 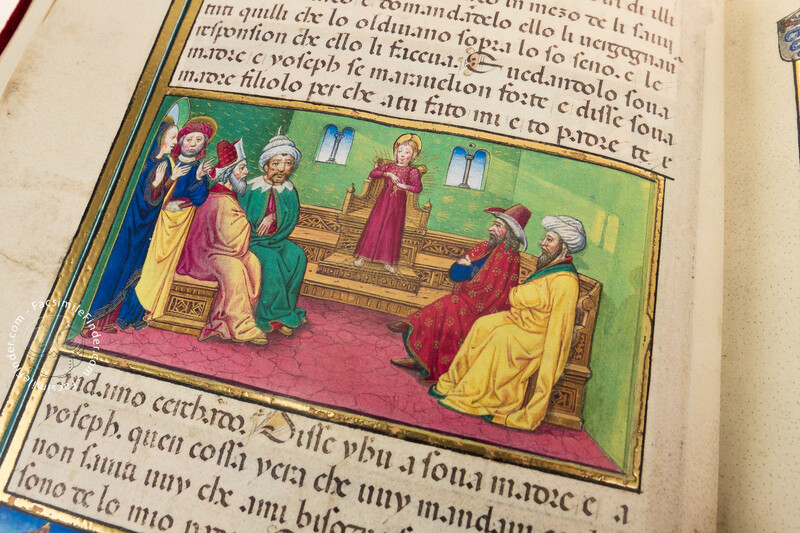 Furthermore, De Predis was an acute reporter of the human nature, which he represented in a variety of emotions. 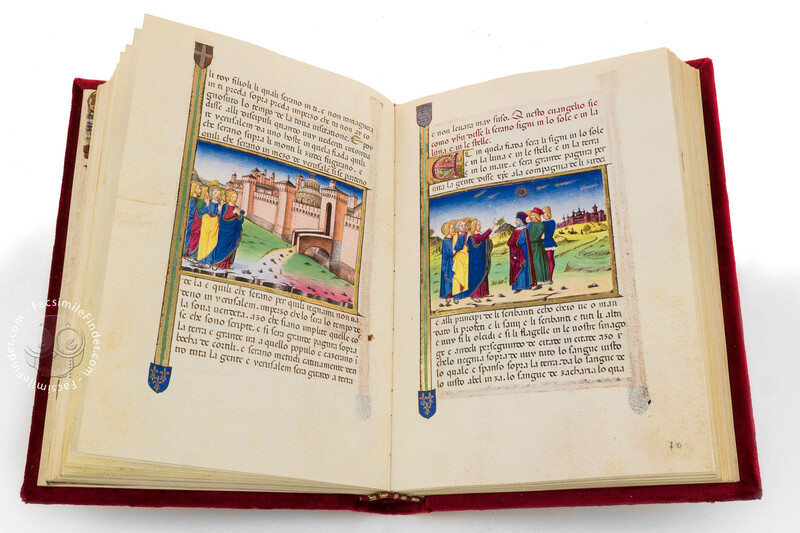 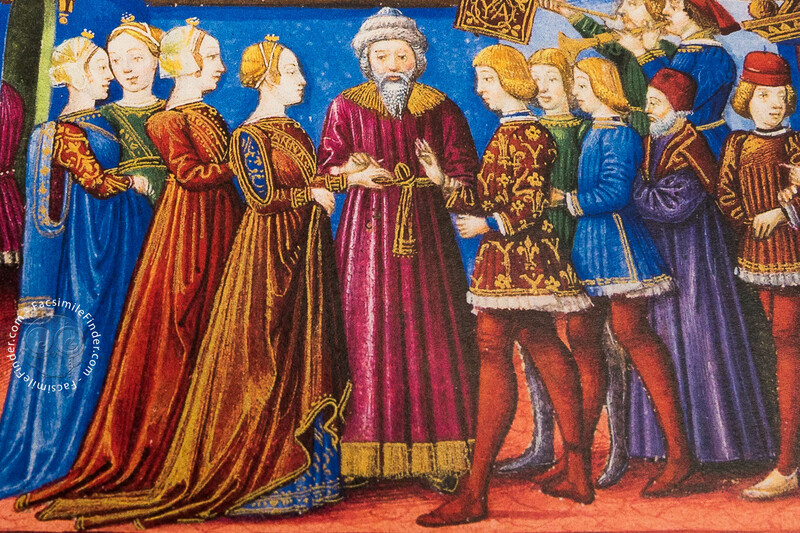 The Sforza Legendarium displays the architectural setting and the figures evoke the Milanese design and fashion of the fifteenth century. 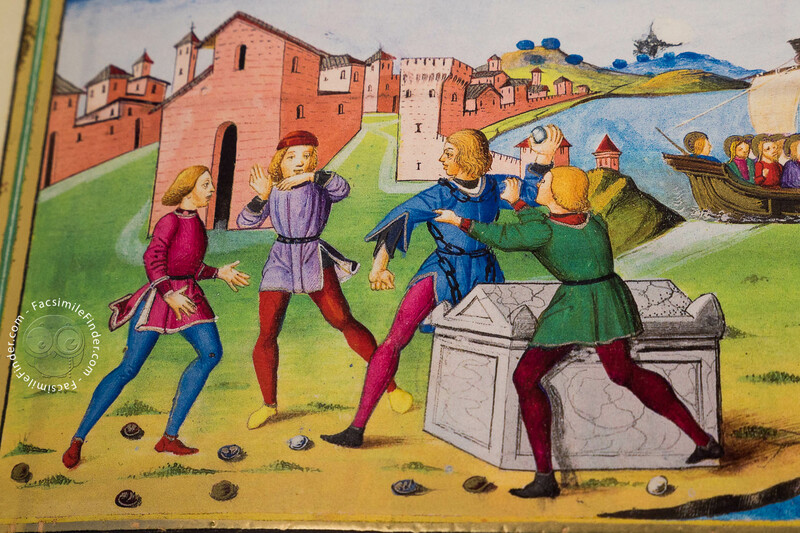 Thus, the urban landscape as well as the people shown in the miniatures would have reminded the Duke of familiar places. 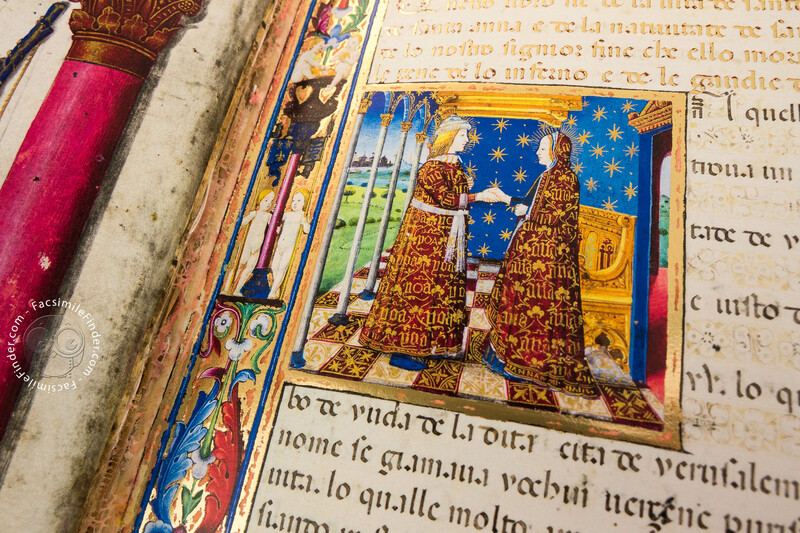 Manuscript book on parchment − 26.2 × 18.5 cm − 316 pp. 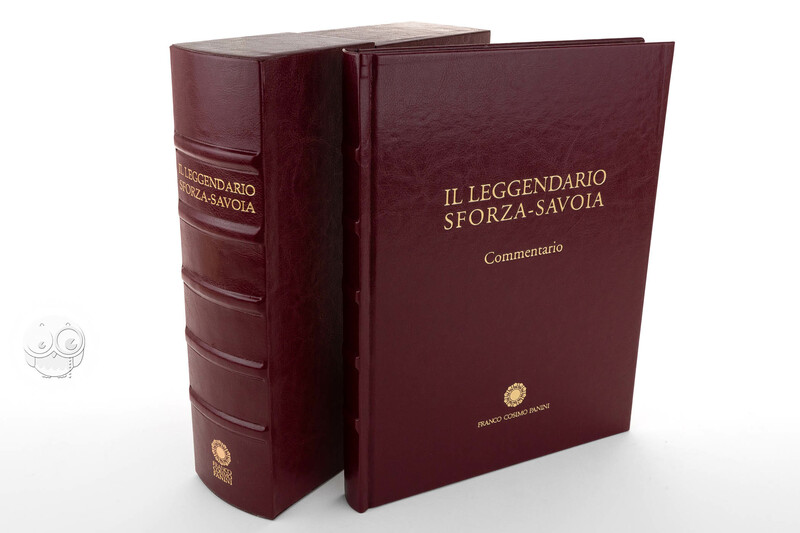 Leggendario Sforza-Savoia facsimile edition by Franco Cosimo Panini. 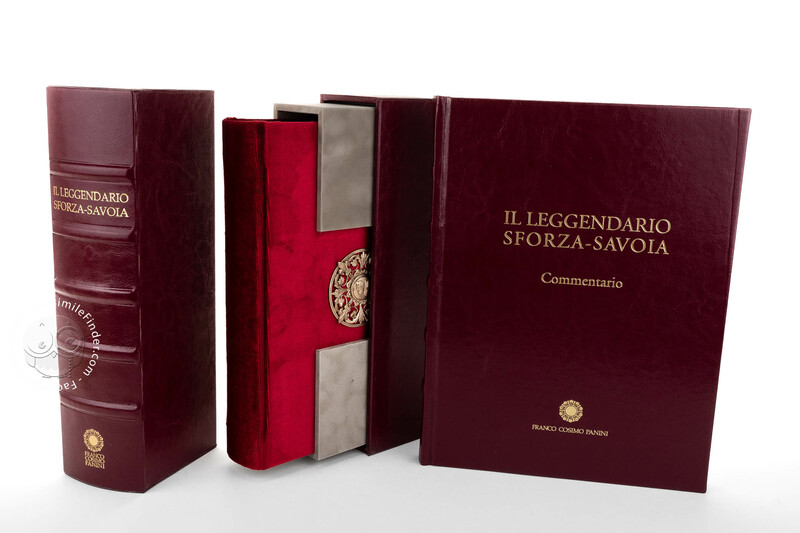 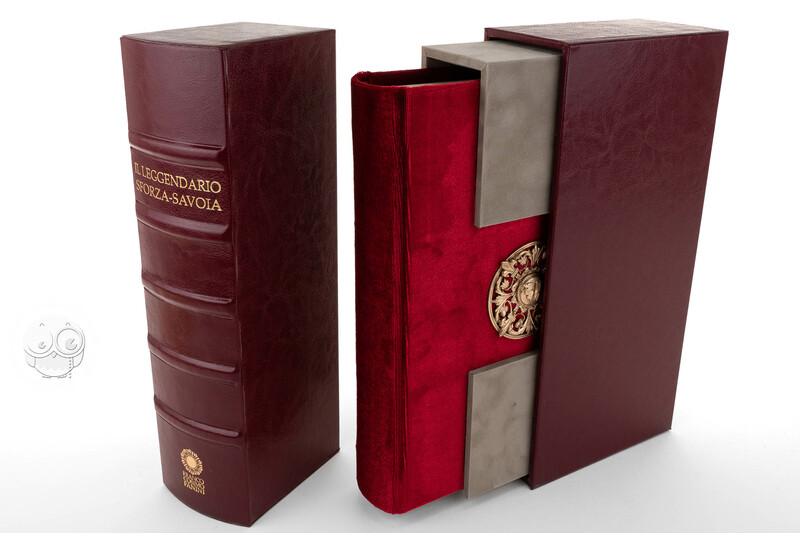 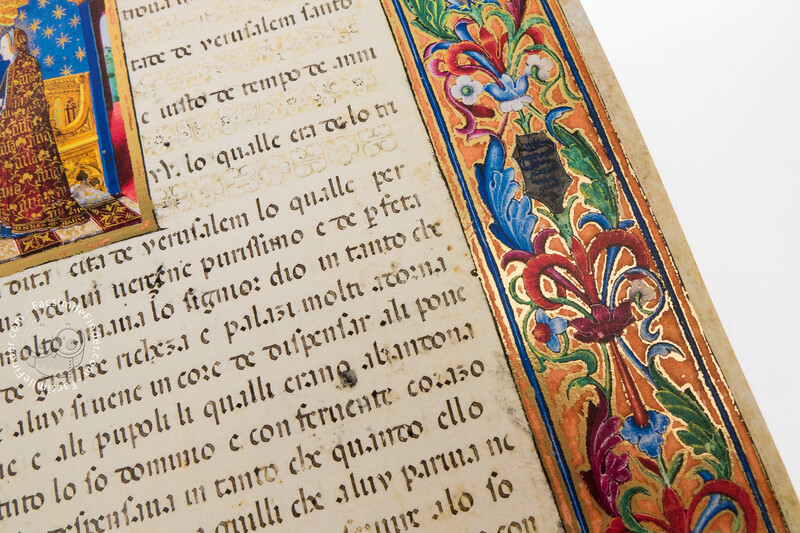 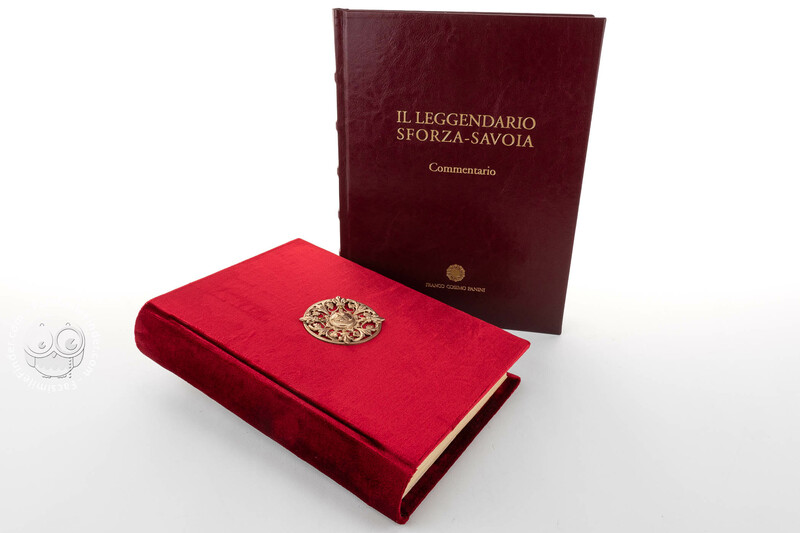 Full-size color reproduction of the entire original document, Leggendario Sforza-Savoia: the facsimile attempts to replicate the look-and-feel and physical features of the original document; pages are trimmed according to the original format; the binding might not be consistent with the current document binding. Das Legendarium der Sforza facsimile edition by Quaternio Verlag.